"The Parking Garage" is the twenty-third episode of the situation comedy Seinfeld. The episode was the sixth episode of the show's third season. It aired on October 30, 1991. The episode was written by Larry David and was directed by Tom Cherones, and takes place entirely in a parking garage. 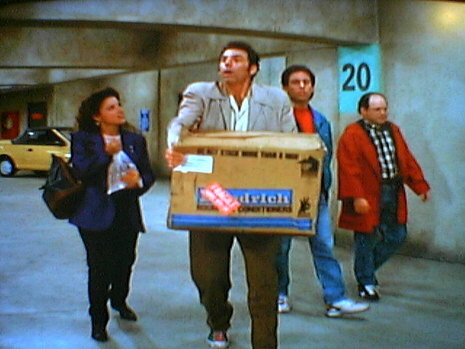 The cast is in search of Kramer's car in the multi-level parking garage of a shopping mall after Kramer purchases an air conditioner. Unfortunately, no one can remember where the car was parked. After carrying the air conditioner for some time, an exhausted Kramer decides to leave it behind one of the parked cars and tries to memorize the number of the parking space. Among other concerns, Elaine fears that her new goldfish will die in the airtight bag before they can arrive home, while George must meet his parents by 6:15 to take them out to celebrate their anniversary. Also, Jerry has to go to the bathroom badly. While the gang searches for the car, Elaine desperately begs passersby in the parking garage to offer them a ride around the building to find their car, but no one is willing to help or has any sympathy for the goldfish. As for Jerry, he is eager to urinate. Kramer encourages Jerry to do it in some dark corner where no one can see him. After Jerry does so, he is spotted by an officer and is held in the officer's booth. Jerry tries to talk his way out of trouble by making up a story about the fictional disease of uromysitisis, but the officer is not convinced. Later, George is also caught in the act of urinating. Both Jerry and George are fined and released. After the two find Elaine, Jerry convinces George to ask an attractive woman, whom they saw earlier in the episode, to offer them a lift around the garage. After the woman accepts without hesitation, the gang all enter into the woman's car and drive off, but moments later, the woman kicks them out after George said something to the woman that makes her explode in anger (the viewers are not told exactly what George said to the woman, but it had something to do with L. Ron Hubbard and Scientology). Then by luck, the gang is dropped off right by Kramer's car but unfortunately, Kramer, who has the car keys, is still lost somewhere in the garage. Hours pass by as George, Jerry and Elaine wait. Finally, Kramer shows up, having gone on his own hunt for the air conditioner. Elaine's goldfish did not survive and George is well past the time deadline to meet his parents. As they all enter the car, the engine fails to start.